Police from two or more districts work jointly to deal with traffic offenders who used to escape them by going to the other side. Police officer Xu Bin (left) talks to an e-bike rider who is found riding his bike in the wrong lane on Monday morning. 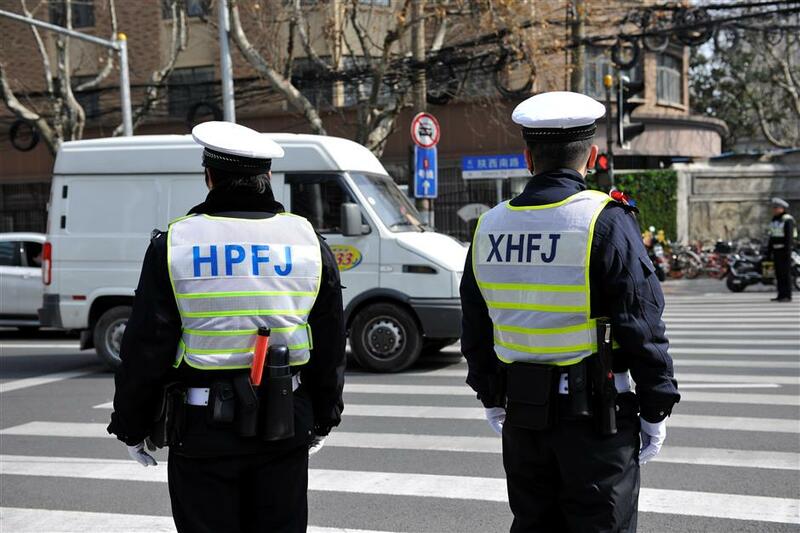 Shanghai traffic police have started to work together to enforce the law against traffic offenders at busy junctions and streets located on borders of two or more districts. By working together at the same spot, police officers from different districts are now more efficient in dealing with traffic offenders who used to escape from them by “going onto the other side,” police said. Downtown Huangpu and Xuhui districts are divided by Shaanxi Road S. at its intersection with Nanchang Road. While the west part of Nanchang Road is located in Xuhui District, the east part of the road and the intersection are in Huangpu. 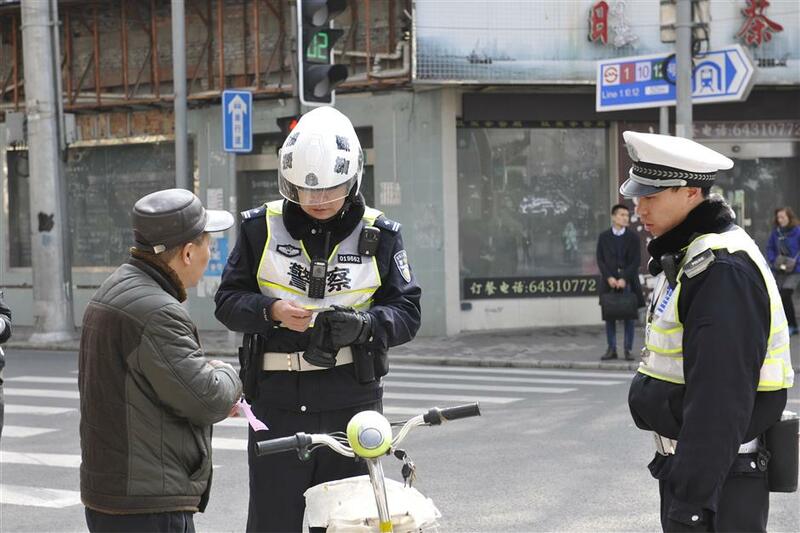 Xu Bin, a police officer of the No.7 traffic police squad of Huangpu District which administers the intersection, said jaywalking and e-bike riders riding on the wrong side of the street are the most frequent traffic offenses here. If an offender moves to the other side, Xu said he and his colleagues can’t “cross the border” to catch and punish them as they are restricted by the rules of their job. For this reason, some “border areas” became “blind spots” for traffic law enforcement, the traffic police admitted. For the past one month, however, police from both districts jointly patrolled during the morning and evening rush hours at this intersection, and also set up road blocks once or twice every week. “When a cross-district traffic accident happens, for example, we can work with our Xuhui colleagues on the site to deal with it immediately,” Xu said. Also, a few traffic assistants work here for five hours every day. One of them is a Huangpu traffic assistant surnamed Ye whose daily beat is the adjacent intersection of Shaanxi Road S. and Huaihai Road M. But for the past month he worked from 9 to 10:30am at this intersection. “There are fewer traffic offenses now compared with a month ago, but pedestrians and bike riders ignoring the red light are still quite rampant,” he told Shanghai Daily. A Huangpu traffic assistant (left) and a Xuhui traffic assistant work together at the intersection of Shaanxi Road S. and Nanchang Road on Monday morning. On Qipu Road which is located between Jing’an and Hongkou districts, traffic police have jointly worked to crack down on illegal motorized tricycles taking passengers. Around the No. 4 exit of Gongkang Road metro station at Gonghexin Road, traffic police from Jing’an and Baoshan districts keep an eye for illegal tricycles and motorcycles taking passengers. At the intersection of Changshou Road and Wanhangdu Road, traffic police from Putuo, Changning and Jing’an districts are working to remove illegally parked shared bikes from the street. Apart from urban districts, similar efforts are also in force in suburban spots such as Xupu Bridge and Minpu No. 2 Bridge where traffic police said they have punished over 70 bikes riders for illegally using the bridges in the past month. On the part of Zhuguang Road from Guanglian Road No. 3 to the border with Minhang District, Qingpu traffic police have together with their colleagues from Minhang issued punishments after over 70 trucks were found illegally parked on the street in the past month.